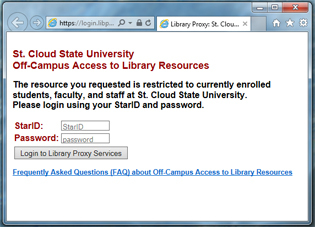 All MnPALS Libraries Search the libraries of all Minnesota State colleges and universities. Use interlibrary loan to request items not available at our library. Search materials from the St. Cloud area public library system. Search materials from thousands of libraries around the world. Click on the FindIt! button and use Interlibrary Loan to request items St. Cloud State University does not own. If you see a different screen or have other problems, Ask a Librarian or contact HuskyTech (320-308-7000).